We almost always tend to ignore the simplicity of life. Meals almost always have to cost a lot to taste good. But in reality, all you need is good company, a decent parking spot near the kopitiam and hope that the shop is open. Haha….my hubby and I have had a 50% success rate with the Xin He kopitiam on Lorong Seratus Tahun. We’ve only attempted to eat there four times, and out of that, only twice have we succeeded. And now we know they close on Thursdays. 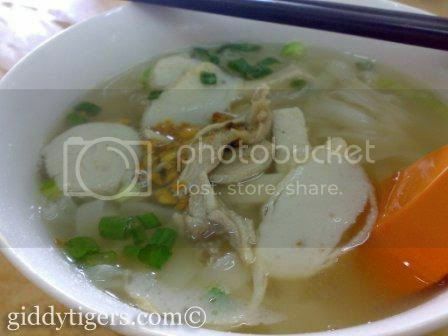 Anyway, today, since I am nursing a cough and a slightly sore throat, I will be all goody-goody and eat koay-teow th’ng. I even had ampula-sui-boey for its supposedly good and curative effects on the throat…..
…..and then I will fight fire with fire and have a bowl of insatiable assam laksa. Good? This entry was posted in Drooling & Cooking, Relax & Celebrate, Thoughts & Scribblings. Bookmark the permalink. The Giddy Tigress says: Must be like a franchise of the Penang stall here. Where is this stall located in KL? The Giddy Tigress says: Do you use it too? Oh dear, get well soon! The Giddy Tigress says: Yeah, it took a turn for the worse last night, when my *dose was duck* (nose was stuck) and I slept it off. Today feeling better but I’ll rest at home. The Giddy Tigress says: I also wanna cepat-cepat sembuh. 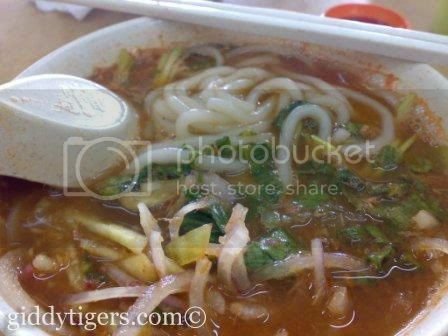 Oh gosh… I miss assam laksa now! I fought cold with cold (cured my sniffles with ice-cream! LOL!) today. Hope you’re all feeling better now and that the bug didn’t pass to either Pete or Ethan! The Giddy Tigress says: I had the flu yesterday – maybe I should have gotten myself a tub of ice cream huh?